The implosion of the collusion theory is a humiliation for everyone who promoted it. The outcome is no surprise to those who scrutinized the facts as they emerged. Time and again, the available evidence undermined the case for such a conspiracy. None of the characters presented to us as Russian “agents” or Trump-Kremlin “intermediaries” were shown to be anything of the sort. None of the lies that Trump aides or allies were caught telling pointed us toward the collusion that members of the media and political figures insisted they were hiding. None of the various pillars of Russiagate—the June 2016 Trump Tower meeting; the fanciful assertions of the Steele dossier; the anonymously sourced media claims, such as Trump campaign members’ having “repeated contacts with senior Russian intelligence officials”—ever led us to damning evidence. And all of that is likely why Mueller never charged anyone with involvement in (or covering up) a Trump-Russia conspiracy. A minimally responsible media and political class would have acknowledged this reality. Instead, leading voices from cable news, Congress, and other influential perches promoted Russiagate by ignoring the countervailing evidence and those who pointed it out. They filled in the evidentiary holes with supposition, innuendo, and outright falsehood. That helps to explain the sizable number of discredited or retracted media reports that advanced the notion of a Trump-Russia plot, culminating in the final collapse of that narrative. This massive gift to Trump should be grounds for a reckoning among those who presented it to him. Prominent media outlets that spun an outlandish tale of a compromised or even treasonous president should be held to account for the most catastrophic failure since the days when the media promoted the fiction of Saddam Hussein’s “weapons of mass destruction” as a reason for the Iraq War. Leading Democrats should explain how it is that their promises of “more than circumstantial evidence of collusion,” as Representative Adam Schiff (D-CA) put it, resulted in zero indictments on such charges when #MuellerTime ran out. Top intelligence officials, both current and retired, also owe us an explanation: not just for their explosive statements—such as former CIA director John Brennan’s prediction earlier this month that a new round of conspiracy indictments was coming—but for their investigatory decisions from the start. That includes relying on the Steele dossier to seek a surveillance warrant against Trump’s former campaign adviser Carter Page, and to open a counterintelligence investigation on Trump himself, motivated in part by disagreement with his public embrace of Russia. Accountability on this front may well serve Trump’s self-promotional claims of a “witch hunt.” But it is vital that intelligence abuses be held to account as well, no matter the partisan consequences. A failure to do so could very well hurt progressives in the future, should overzealous intelligence officials put them in their sights. 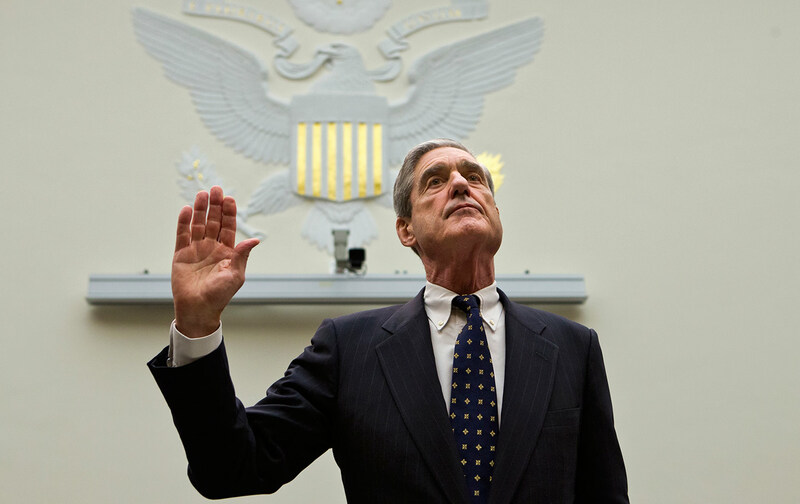 A major part of that process should be the public release of the Mueller report and as much of the underlying evidence as possible, as Democrats rightfully demand. But that rallying cry should not be used as an opportunity to double down on the conspiracy theory that Mueller has rejected. There are already rumblings from Democrats and the media about a potential cover-up and unresolved questions about Trump and Russia that only further congressional inquiries can resolve. These same voices were the ones who implored us to put our faith in Mueller as his investigation unfolded. They should heed their own advice now that his investigation is complete. Aaron MatéTwitterAaron Maté is a Brooklyn-based journalist and former host/producer for The Real News and Democracy Now!.